for my second game of 2014 i finished all the main courses with all the exits and star coins in new super mario bros. U. although it was a launch title for wii u and i’ve had it for more than a year, i ignored it for a long time. whenever i did force myself to sit down and spend some time with it i quickly lost interest, and my current wii u momentum is the main reason i was able to finally finish it. my interest in the game was also renewed by the fact that it’s been more than a year since i finished NSMB2. at the time new super mario bros. fatigue was already threatening, and despite my hoping otherwise new super mario bros. U is easily one of the least innovative main series mario games ever. this is astounding and extremely disappointing since mario games used to be synonymous with innovation, but quite frankly the game feels more like DLC to new super mario bros. wii than a proper new game, let alone one that inaugurated a new console. To put it bluntly, your interest in NSMBU will hinge on how much of the previous three games you played, and how recently you played them. Aside from playing it too safe, Nintendo’s gravest miscalculation with this game is releasing it a mere three months after New Super Mario Bros. 2 on the 3DS. But for now, the seamlessness with which you can transition between big and small screens, without fiddling with syncing another device or downloading some companion app or whatever–just hit pause and go in the other room and you’re done–is still mighty impressive. despite my initial boredom, by the time i got to the end of the game i had a much better opinion of it. along with off-TV play, the squirrel suit and blue baby yoshi are fun to play with (although not enough to sustain an entire game, esp. since the other baby yoshis are pretty standard/useless) and the miiverse integration is nice, although super mario 3D world did it better. but what really makes the game worth playing is that the mario foundation is so strong that even with the far too rigid adherence to formula, more levels are still fun to play. is it more fun than NSMB wii? perhaps marginally, but not enough to justify it being created when a more-innovative experience could have been created instead and the game made me appreciate the innovations that NSMB wii did introduce, or at least all the elements it re-introduced (such as the koopalings). this game was clearly calculated to serve a purpose, namely be developed in a short amount of time and drive wii u sales, but it’s a shame that nintendo resorted to using their star series in such an obvious ploy and has compromised on what the series has always been about up to recently. 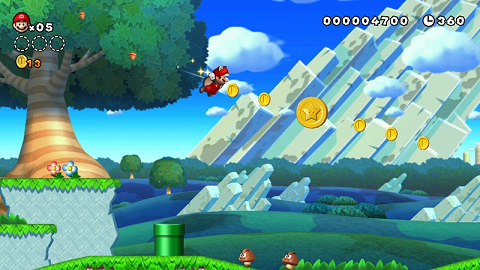 Everything about New Super Mario Bros. U is pretty exciting, except the game itself. Is it possible that this is the best game in the “New” series to date–not to mention one of the best exclusive Wii U games on the market, by default–and at the same time kind of flatly uninteresting? Apparently so. The game is perfectly well made for what it is, and I had plenty of fun playing it in short bursts here and there, but at this point the series’ by-the-numbers design philosophy is starting to lend the name “New Super Mario Bros.” a degree of unintentional irony. my only comfort is the hope that the time nintendo saved on churning out this game is going to lead to a roster of great games coming out this year. wii u continues to stumble along, and what it comes down to, as it should, is the games. like NSMBU we’ve seen some iterations in familiar series, but i’m still waiting for a truly uniquely nintendo experience for wii u. super mario 3D world has come pretty close, but even as a diehard nintendo fan i’m still waiting for the wii u to become an essential console.